Design: Your site ought to be professionally designed, attractive and engaging and be easy to navigate in order to quickly gain the visitors’ attention and interest. Good use of images is important as well as the use of action shots of you with your clients. Content: Your site must focus on your visitors’ interest and addresses the question of what’s in it for them and how to improved their businesses and lives. To accomplish this, strong content must be developed in the form of products, services, and intellectual property while constantly evolving. Strategy & Tactics: What should the business look like and how should it position itself online. What Internet components are critical to make the business a success. How should you reach and communicate with your current and future customers? Should they be able to purchase products, read articles, subscribe to newsletters, communicate through blogs and online communities? The Missing Map – This organization has a site that is well designed with great content yet no defined strategy and tactics to create an Internet success. It’s like driving a great car without a GPS system or an effective map to follow. You’ll be wondering why you are not reaching your destination. The Ugly Book Cover – This organization has a site that has great content and powerful and effective strategies and tactics yet the site is poorly designed and navigated. Most visitors would either close their browsers or press the back button to go to their previous site. The Boring Show – This organization has a site that reminds me of going to see a theater show that was well advertised and promoted with great and colorful posters. Yet when you get to finally watch it, there is nothing there. Just a terrible and boring show. Some site unfortunately suffer from the same syndrome. 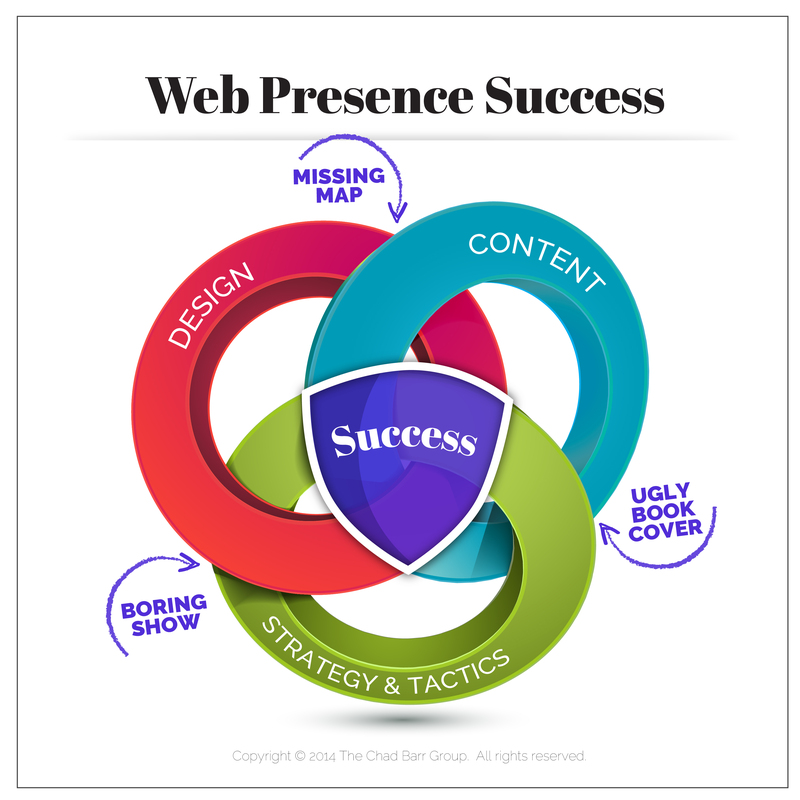 Success – This organization is reaping the most benefits of effective web strategies. Any missing element and success is either delayed or non-existent. Yet when all three circles and elements intersect that ultimate success is achieve.